The internet has exploded with the news. 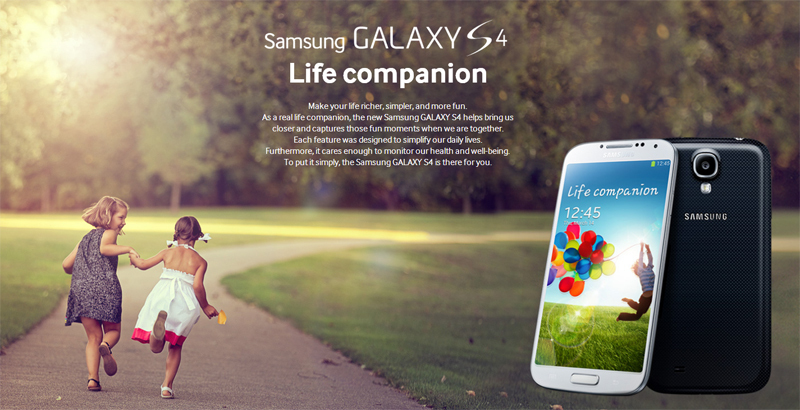 One of the most anticipated smartphone, Samsung Galaxy S4, is finally out. As I always mention with other product releases, the leaks turned out to be right once again. Samsung tried their best to keep their product sealed but unfortunately the spec details were out long ago and pictures along with a hands-on video just weeks before the release which ultimately turned out to be the right device. Galaxy S4 in one word – a Beast. The best way to describe this phone is to say that it’s Galaxy S3 on steroids. Why? Because the Galaxy S4 retains the same body language but with much more powerful hardware in it. Let’s have a brief overview of Samsung’s the next flagship, the Galaxy S4. Before proceeding, do take a look at the range of accessories available for the Galaxy S4 at Mobilefun.co.uk if you are planning on getting one. Click here to visit. With a 5-inch Super AMOLED Capacitive touchscreen, 441 ppi pixel density and 1920 x 1080 in resolution, the Galaxy S4 blows everything out of the water. Though the predecessor also had the same capacitive touchscreen, it had lower pixel density and resolution (1280 x 720). The display screen is protected by the latest Corning Gorilla Glass 3 which means there’s a higher probability that the screen won’t get smashed if you manage to drop it! The Galaxy S4 will come in two variations depending on the region it will be sold in. It will either be armed with a Exynos 5 Octa (8 cores) or Qualcomm Snapdragon S4 Pro processor which mean the lucky user might get a 1.6Ghz Octa Core or a 1.9Ghz Quad Core processor. No matter what chipset you get, the S4 will have a great horsepower. One of the interactive features of Galaxy S4 is the camera. With a 13 MP rear camera, users will be able to capture pictures in dual shot mode and also be able to record dual video. This means, if you find something interesting happening, you will not only be able to capture the moment in front of you but also the capture the expression the surrounding people are having too. Users would also be able to make dual-video calls through the 2 MP front facing camera. In comparison, the S3 had only 8MP rear and a 1.9MP front facing camera. The body of Galaxy S4 is pretty much the same but is thinner than the SI3by 0.7mm. It’s also lighter by 3 g. It’s not much of a difference but it’s there. The height of the mobile remains the same except the screen has been stretched to 5 inches. To make things even better, S4 will be featuring the latest Android OS version 4.2.2 Jellybean. At least staying ahead of it’s competitors HTC and Motorola. The Galaxy S4 is filled with interactive features. Air Gesture is one such feature which allows the user to simply swipe around the pages without even touching the screen. The sensors detect the movements of the fingers and allows the user to scroll through the web pages or files. Smart Pause is another feature which will stop the movie playing once the user loses eye contact with the phone and also scroll down the page once you reach the bottom This may seem useless to some but it does save time by not having to press press the pause button. Other features include Adapt Display, S Translator, S Health, Samsung Knox, Samsung HomeSync and Smart Switch. All these gesture features is attractive but the Group Play function will most likely see significant popularity. Group Play is where users can enjoy photos, music, games and documents without requiring any WiFi access point, bluetooth or even cellular signal. This would be big. The battery life in S4 seems remarkable as it has a Li-on 2600 mAH battery. That’s a big powerhouse, bigger than the iPhone 5 which only has a 1400 mAh battery and the newly released HTC One with a close 2300 mAH. Some people might hate it, some may like it. The main reason for disliking the phone would be it’s body design as it does not have any ‘wow’ factor in it. But why do we always have to judge the book by its cover? In my perspective, apart from the body design (which was a little disappointing even to me), the hardware and the features are top class. This will definitely be worth the money for those who are looking for an upgrade. For me, personally? I would rather wait for the phone with Youm display. The Samsung Galaxy S4’s pricing hasn’t been disclosed yet but it will be available to US carriers T-Mobile, AT&T, Cricket, Sprint, U.S. Cellular, and Verizon starting this April. Check out the inforgraphic below provided by Samsung Mobile. Verizon has started accepting sign-ups for the upcoming Galaxy S4 although there isn’t any date fixed yet for the final release. According to Verizon, the mighty S4 would be available in May. T-MObile will start selling the Galaxy S4 from April 24 and will cost $149.99 up front plus $20 per month for 2 years. AT&T has started accepting pre-orders but has not said when the S4 will go on sale. The price starts at $199.99 with a two year contract. Spring will sell the S4 starting from April 27 at $249.99 with a two year contract. Compared to others, Sprint seems to charging more, maybe because they are offering only the higher storage version. Do share your views on this latest flagship. Would you get one or just pass? This product where is available in Bangladesh & how much price range ?